When you first start Aurora Suite, if you want spoken feedback or if you are using Aurora to communicate verbally with other people, you will need to select a speech synthesizer. 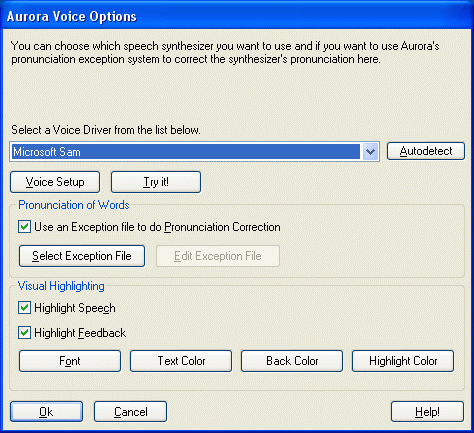 If you have never used Aurora Suite before, it will prompt you the first time you start it to select a speech synthesizer. You can get back to the Voice Options dialog through the menu bar or right-click menu of any Aurora Suite window. The Voice Options dialog will list all the speech synthesizers that are installed on your computer. Select one of the voice drivers from the list, you can press Try It to hear the selected synthesizer speak. You can try the different voice drivers until you find one you like. Windows 2000 does not come with any speech synthesizers by default. Windows XP comes with one Microsoft voice. Additional Microsoft speech synthesizers should be installed during the Aurora Suite installation. If you would like visual highlighting when Aurora Suite is speaking, you should check the box next to Highlight Feedback in the Visual Highlighting box. This will make the Visual Highlighting window appear on your desktop. To learn more about Voice, see What is Voice.